In the middle of a fierce storm at the tail end of the Second World War a German bomber crashes into the vast Vatnajokull glacier on Iceland. One man sets off for help, the pilot and five passengers remain with the plane, slowly being covered with thick snow and being swallowed by the ice. Forty four years later and the melting glacier starts to give up its secret. The American secret service sends in a team to try and salvage the plane without alerting the Icelandic government of its mission. However, their presence on the glacier is discovered by two young mountain rescuers out on a training mission. Elias manages to briefly phone his sister Kristin, a lawyer for the Foreign Ministry, before he is surrounded by soldiers. Not only will he have to die to protect the secret of Operation Napoleon, but so will his sister. But when two American operatives force their way into her apartment she manages to escape. Fearing a conspiracy between the American and Icelandic governments she doesn’t know who to turn to, all she knows is that her brother is in trouble and quite possibly dead, and the American’s want her likewise. On the run, she resolves to find out the secret of the crashed bomber. 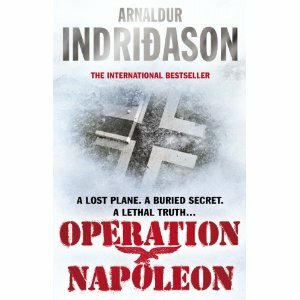 Operation Napoleon was originally published in Icelandic in 1999, Indridason’s third book after the first two, as yet untranslated, Detective Erlendur novels. 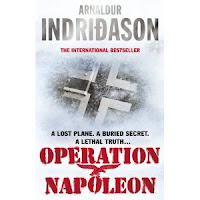 Unlike his police procedural novels, Operation Napoleon is a thriller. 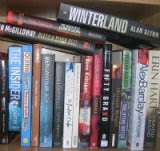 The strengths of the book are the characterisation and the pace. Kristin is well penned and her back story well elaborated, and the other characters have sufficient depth to be memorable and credible. Indridason keeps the pace high throughout, with sufficient tension to keep the reader turning the pages. Where the book suffers, however, is with respect to the story. It starts well enough, with Indridason setting the characters and back story in place, but from the minute Kristin ends up on the run it is difficult to believe in the story. It’s interesting, and at times exciting, but never really credible. The minute I start to ask, ‘but why didn’t ...?’ or ‘how come ...?’ questions a story is in trouble. I was asking these questions every twenty pages or so. And the ending is simply ludicrous. I won’t say anything to avoid spoilers, but however history would have unfolded it would not have resulted in this ending. Given the pacing, the book lacks the introspection and philosophical elements that are the real strengths of the Erlendur novels. Overall, a fairly entertaining book as long as you’re prepared to suspend your sense of realism.